ANN ARBOR, Michigan, April 30, 2013 (ENS) – Long term exposure to air pollution is linked to heart attacks and strokes because it speeds up hardening of the arteries, known as atherosclerosis, according to University of Michigan scientists and colleagues from across the United States. 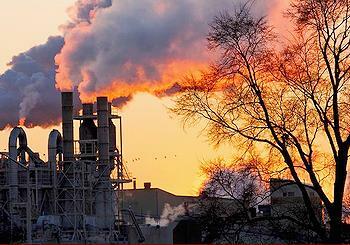 “Our findings help us to understand how it is that exposures to air pollution may cause the increases in heart attacks and strokes observed by other studies,” said Adar. The scientists found that higher concentrations of fine particulate air pollution, PM2.5, were linked to faster thickening of the inner two layers of the carotid artery – a blood vessel that provides blood to the head, neck and brain. Fine particulate matter consists of particles of dust, dirt, soot, smoke, and liquid with a diameter of less than 2.5 micrometers or 1/30th the width of a human hair. It is produced by motor vehicles, power plants, and other combustion sources. Particles can be suspended in the air for long periods of time. Some particles are large or dark enough to be seen as soot or smoke. Others are so small that individually they can only be detected with an electron microscope. The scientists on this study also found that reductions of fine particulate air pollution over time was linked to slower progression of the blood vessel thickness. The thickness of the carotid artery is an indicator of how much hardening is present in the arteries throughout the body, even among people with no obvious symptoms of heart disease, the scientists say. The researchers followed 5,362 people ages 45-84 from six U.S. metropolitan areas as part of the Multi-Ethnic Study of Atherosclerosis and Air Pollution (MESA Air). The scientists were able to link air pollution levels estimated at each person’s house with two ultrasound measurements of the blood vessels, separated by about three years. After adjusting for other factors such as smoking, the authors found that on average, the thickness of the carotid vessel increased by 14 micrometers each year. The vessels of people exposed to higher levels of residential fine particulate air pollution thickened faster than others living in the same metropolitan area. “Linking these findings with other results from the same population suggests that persons living in a more polluted part of town may have a two percent higher risk of stroke as compared to people in a less polluted part of the same metropolitan area,” Adar said. Cardiovascular disease, which affects the heart and blood vessels, is a major cause of illness and death worldwide, the researchers explain. In the United States, for example, the leading cause of death among adults is coronary artery disease, in which narrowing of the heart’s arteries by atherosclerotic plaques – fatty deposits that build up with age inside arteries – slows the blood supply to the heart and may eventually cause a heart attack. The fourth leading cause of death in the United States is stroke, in which atherosclerotic plaques interrupt the brain’s blood supply. Smoking, high blood pressure, high blood cholesterol levels, diabetes, being overweight, and being physically inactive all increase an individual’s risk of developing cardiovascular disease. Treatments include lifestyle changes and taking drugs that lower blood pressure or blood cholesterol levels.